The synopsis also makes this one sound like a lot of fun, in the style of a traditional epic fantasy. Plus, I’m always interested in trying debuts. Assassins vs assassins? And an interesting premise. This one looks promising! Ooh interesting! That’s a new to me one! Hope you love it once you read it! I always enjoy seeing the comparisons. Is this going to be more like Hobb, an author who knows how to do characters and is one of the titans of the genre, or Dalgish whose first book was barely readable? What if I am a fan of one and hate the other? Or did they just google ‘fantasy assassin’ and start jotting down names? 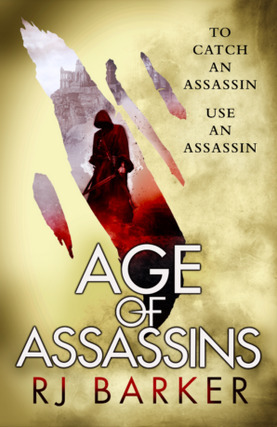 I haven’t read many assassin books but this one does sound interesting. I like the cover as well. Enjoy! I haven’t been that into assassin books lately, but I gotta admit that there’s something very fun sounding about an assassin v. assassin story! Those are some big authors the summary is dropping. I’m cautiously optimistic haha. I know! I’m always a mix of excited and wary when I see namedropping like that, lol! Sometimes it pays off I guess haha. At least the premise sounds good, even if it ends up falling a tad short. Assassins, like dragons, never fail to attract my attention (now, if someone would write a story about an assassin who’s also a dragon, I’d be happy 😀 ), and this novel sounds exactly what would meet my tastes. On to the list it goes! Thank you!!! Assassins, kingdoms, knights, epic fantasy… the synopsis of this book has so many things I love and look for, in fantasy books. I hope you enjoy this book when you get the chance to read it! Ohhh, you had me at assassin versus assassin. Totally going to check this one out! Assassins, heists, dragons – yeah, colour me interested. Not to mention pirates, westerns or any combination of all of them probably. This sounds good and not a long wait.